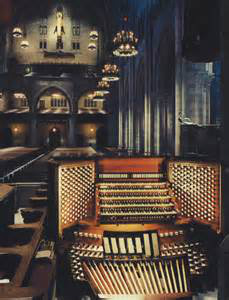 For the player who knows how to listen, organ music will suggest its own tempo relative to the instrument's action and breathing in its own acoustical environment. Speed in organ playing therefore is an illusion. What counts is how well a language of warmth and meaning can be communicated, and how well the majestic powers at work on the page can be delivered clearly to the listener, without upsetting the music. In pursuing these objectives, extremes should be avoided like the plague. No music from the standard repertoire illustrates this better than the Toccata from the Fifth Organ Symphony of Charles-Marie Widor. This work, a favorite wedding classic and postlude for feast days, is pure rock and roll for the organist. It's the equivalent of sitting in a Lamborghini Gallardo on the open road, pressing down the gas, and feeling the G-forces pressing you back into your seat. It even has some organists disturbed that most of the congregation has left before its big pedal octaves enter with the return of the theme, which is its best bit. It's Widor's best known organ piece and the most recorded organ work in history second only, perhaps, to Bach's "Great" Toccata and Fugue in d minor. Because it's 10 pages long, has over 5,000 written noteheads, and proceeds in an unbroken rhythm from beginning to end, it's become, through no fault of its own, a vehicle for display, a transcendental etude "a la Liszt," a tool for measuring the extreme to which a fast tempo can be red lined. It was not conceived as an etude, but it's almost single handedly given birth to the mistaken idea that whoever can perform it at tornado speed without dropping a note can play anything. Some players even argue, with apologies to Bach, that this work "is the greatest organ composition ever written" and the result, when they play it, sounds more like the Flight of the Bumblebee than Widor. In so doing, the work is reduced to little more than a time trial. Organists, especially new organists, sometimes sell themselves short. Don't let this one scare you. It isn't the hardest organ piece to learn. There's a lot to consider when practicing it, but It isn't insurmountable. It will take a little attention to get it under your fingers, but it will fall in place more quickly than you might think. We just need to come at it thoughtfully and remember not to fall into the "speed is skill" trap. The use of "bat out of hell" tempos at the organ causes all short notes played in rapid succession to blur, to collapse into each other. What reaches the ear of the listener unfamiliar with the printed page can be nothing more than an indistinct wash of sound. It's hard to take in the countryside at 500 mph. The same is true in music. We need to be careful not to expect to dart through this work at a ruinous tempo, playing it as if we're parked in a tow away zone, and not giving it time to develop a life of its own [see Balance In Organ Playing, Part I]. The composer created it to be music, not a speed drill, and it's up to the performer, you and me, to breathe life into what can easily become yet another empty performance of an old standby. Practicing the manual parts of this work on a piano or mechanical action organ will drive home the point that the instrument itself will set certain technical bounds to speed. The keys for the reiterated left hand chords in this piece require a tiny split of a second to rebound sufficiently before they're pressed down again. This is not always evident to those who perform only on electrically assisted actions where the keys are equipped with springs which rebound more quickly and can accomodate runaway tempos at the expense of serving the music. It makes one realize that electrically assisted actions render the manuals of an organ inert, the old sense of touch dies [See blog, Touch, Parts I-V], and it becomes more obvious that the organ with its long drawn-out sounds is contrary to the idea of extreme rapidity. Recording on the magnificent Aeolian-Skinner organ in the almost strangely dry acoustics of New York City's Riverside Church (photo), Virgil Fox raced through this piece in only 4:30 minutes (crotchet = 152, roughly). This break neck tempo, which hauls the listener by the scruff of the neck from beat to beat, would have qualified for the Guiness Book of World Records were it not for Jeanne Demessieux who recorded it at St. Mark's Church in London in a mere 4:24 minutes (crotchet = 156, rougnly), the most extreme tempo of any recording known to this writer. After listening to Virgil's tempo some have complained about being bored to death whenever this music is played less fast. Being able to display tremendous speed is a wonderful gift to have but, again, that's virtuosity and not serving the music. Widor would be getting out of his grave, grabbing Virgil and Jeanne both by the neck, and shaking them to learn that educated musicians like them are laboring under such a misconception. Prestissimo is not what the composer had in mind when he marked the score "Allegro," which means "lively." When Widor himself recorded it at Saint-Sulpice in Paris in 1932 the performance time clocked in at 7:00 minutes (crotchet = 80). A ponderously slow tempo (crotchet = 62, roughly) at the extreme end of the scale is traditionally used by Vatican organists when performing it at St. Peter's Basilica in Rome, often as a recessional for Christmas Eve midnight Mass. This translates to an overall timing around 7:30 minutes. Under most conditions this tempo would be entirely too slow and sound like the organist was trudging through molasses, but when performed in this largest church in the world where it takes time for the clergy to travel the long aisles, ponderous tempos like this can at times be helpful in getting recessional music to "stretch." But the price to be paid for stretching music this much to fit a longer time frame is that it can sound labored, which it does. It often helps to keep the wrist moving and the rhythmic framework flexible using a mix of two basic tempos: 1) a brisk starting tempo (crotchet = 118, roughly) when the moving notes are in the right hand, and 2) a very slightly slower Tempo II (crotchet = 110, roughly) when the moving notes switch to the left hand, to keep the left hand clear. This coordinated mix of 2 tempos, along with a liberal use of minute pauses and stretch outs placed where something ends and something else starts, usually succeeds in avoiding this music's chief danger (monotony) because of its unbroken rhythm from beginning to end. When performed this way, the work occupies just a little over 6 minutes. A playing time of 5:30 minutes seems to define the speed threshold at which, if played any faster at all, distinctness is sacrificed. We have to be very careful with this one, as our technique grows and permits us to play it faster, to keep it from sounding like one loud mess.